While the Daily Express is generally known for its isolationist, rightwing views, this isn’t the first time it has published a balanced piece on the efforts of the 9/11 Truth Movement. In February, it profiled Matt Campbell, the Briton who lost his brother Geoff on 9/11 and is actively calling upon UK authorities to open an inquest into his brother’s death. 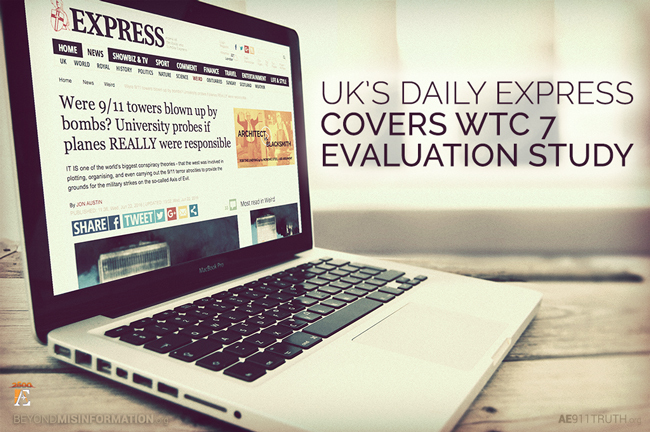 We would like to give a big thank you to everyone who has supported and promoted the WTC 7 Evaluation project. If you would like to learn more about it and get behind it, visit WTC7Evaluation.org. Now that the university is in its summer session, Dr. Hulsey and his team are back to working full-time on the study. We look forward to reporting their progress at the end of the summer! We had a visitor from the UK at a recent 9/11 Group meeting in Dallas. She told us that a vast number, if not majority, of people in the UK know about the 9/11 Cover-up. Any press like this helps to give these aware folks "a reaffirmation". Unfortunately, many people who are aware of the 9/11 Cover-up are also not aware that a HUGE number of people know. However, when a person gets involved in getting the word out, they soon discover that many, many people know. This makes visibility, action and outreach important. Outreach lets others who are aware of the 9/11 Cover-up know that they are not alone, much less helping to inform the uninformed. We can create a snowball effect by being more active. Any action, big or small, counts. TomT on Sun, 06/26/2016 - 10:56pm. I strongly agree about the snowball effect. The University of Alaska study and the 28 pages are two places where I see great potential for this. A former commenter, I think it was LeftWright, used to speak of 9/11Truth as approaching a "tipping point." I think that is really happening now. There has been tons of legitimate research regarding 9/11, but now we are seeing legitimate actions that are also mainstream. When these actions can be pointed to, it is helpful in bringing people into the conversation who might not have been willing to join previously. It will likely embolden professionals to speak out, since stigma will be reduced. Giving reaffirmation to those who have been around a while, as well as bringing new people on board, are both essential. Thanks for being an important part of that. The truth is going to emerge. Satyakaama on Mon, 06/27/2016 - 12:02am.